How do you top the Wicked Witch of the West, who many children say they were scared of? How about a princess who can remove her head and replace it with others in order to stay young? 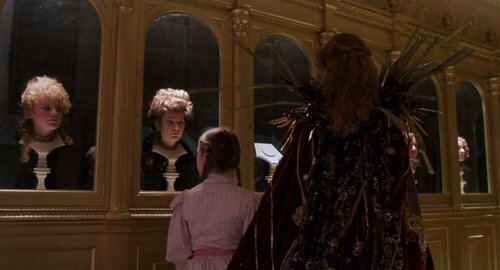 Princess Mombi is the most terrifying thing about Return to Oz. 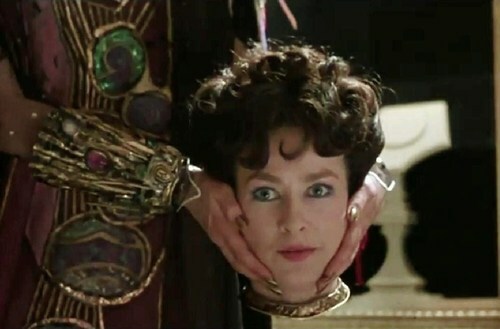 The viewer not only get’s to see Princess Mombi appear with different faces, but we also get to see her without any head at all. In addition, the princess tells Dorothy that she wants to keep her in a tower until she matures so that she can cut off Dorothy’s head and add it to her collection! If that wasn’t scary enough, the viewers (and Dorothy) are shown a room where the princess keeps all these heads! Surprisingly, that wasn’t even the scariest part. The idea of a princess who can change heads alone was enough to really creep me out as a kid (and still does as an adult), but things only get creepier from there. The princess locks something that Dorothy needs to escape in a cabinet, but it is locked with one of her heads. When Dorothy attempts to retrieve that item, the head (still without a body) wakes up and yells at her, “Nauuuuuughttttty girrrrllll!! !” The head’s yell was done in such a chilling way, but the creep-out factor only increased when the yell wakes up all the other heads (all also in separate cabinets and without a body), causing them all to start screaming in different pitches! The music then rises in a very horror movie-sounding way and as Dorothy flees from the room, the viewer can see Mombi’s headless body rising from a bed in the background. Then, as Dorothy runs from the room, Mombi’s headless body reaches out for her while making this gurgling sound as if it was trying the speak, but it can’t without a head. The whole scene was completely terrifying as a kid (and is still waaaay creepy as an adult). So much so, that when I grew up and fell in love with horror movies, I had to seek out this movie just to see the scene again! This entry was posted in Creepy Kids' Movies, Return to Oz and tagged Creepy, creepy kids' movie, Disney, disturbing, Dorothy, Dorothy Gale, Mombi, Princess Mombi, Return to Oz, scary, Wicked Witch of the West, Wizard of Oz by timothyheinz. Bookmark the permalink. I’m pretty positive she doesn’t say, “Naughty girl!” She says: “Dorothy Gale!” And I love this movie. Watched it hundreds of times as a kid. You’re absolutely right! I can hear it now. When I originally wrote the post, I couldn’t verify what she was screaming. Some sites said it was “Naughty girl!” Some said, “Little girl!” (which didn’t seem right). While others said it was, “Dorothy Gale!” Now, when I look it up, I can see that sites are saying Princess Mombi is screaming Dorothy’s name. In any case, whatever she screamed, the scene was definately creepy and stuck with me all these years. I was glad to find that this scene, and the whole movie, held up to how good I remembered it being as a kid. You are not exaggerating, it really is creepy even for an adult. This movie is just wonderful.